O'Connor-Hartley Investments, L.P. (OHI) is a limited partnership with both general and limited partners. The value of the holdings is confidential and is reported only to the partners and to the IRS. The OHI goals are capital preservation and income. 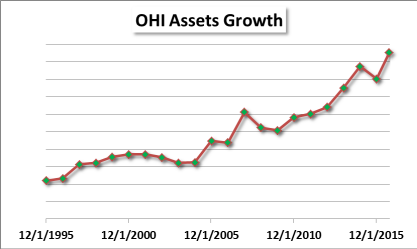 OHI invests most of its assets in stocks and bonds. 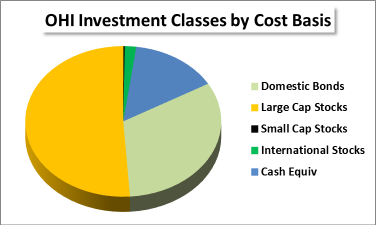 The allocation among investment classes will vary as the situation demands. 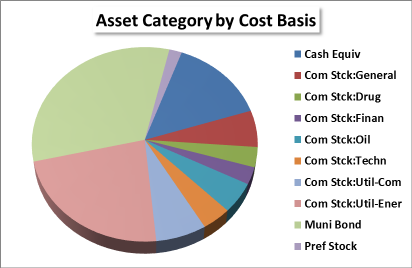 However, a typical asset allocation among various classes of investments is shown to the right. A different division, by asset category, is shown at the far right. The asset categories shows the stock sectors. The management style is conservative and patient. Bonds are held to maturity and stocks are typically managed as "buy and hold." Results are observed daily and evaluated annually; however, changes are made only when significant events require them. The figure to the right shows the growth in asset value over the last twenty years. While clearly not constant, the growth rate has averaged around 8% per year. Additionally, the income as a percentage of the asset value has averaged more than 4% each year. The income is distributed annually to the partners. These facts indicate that the goals for OHI are being met. Return to Dr. Dean S. Hartley III Entrance.